With a total of nine bays of structural fabric, the roof is divided into two, with four bays in one section and five in the other. 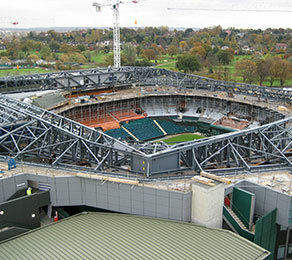 A total of 10 steel trusses, each weighing 70t and spanning 77m, fasten the bays. Each truss is supported by a set of wheels that advance along a track. CCL engineers designed special bespoke spin-mounted, guided and fixed uplift bearings to suit this prestigious project. The calculations provided by CCL helped to prove the project’s feasibility at early stages of the design. CCL was closely involved with SCX on the project for over four years, from concept through to final design and installation. The ability of CCL’s engineers and its in-house software to cater for the required movement criteria, allowed modification of the designs as the project evolved. Hydraulic jacks and arms move the trusses apart and stretch the fabric between them until the north and south sections seam over the court. The speed of truss deployment is 214mm per second. CCL was able to supply the bearings to meet the demanding project schedule and to ensure the project was handed over to the client in time for the first scheduled match.